The Women's Flying Training Detachment (WFTD) and the Women's Auxiliary Ferrying Squadron (WAFS) organized separately in September 1942. They were pioneering organizations of civilian female pilots, employed to fly military aircraft under the direction of United States Army Air Forces during World War II. 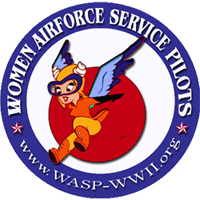 The WFTD and WAFS merged August 5, 1943, to create the paramilitary Women Airforce Service Pilots (WASP): 25,000 women applied; 1,830 were accepted; and 1,074 of them passed the training and joined. (A 59% success rate vs. 54% for USAF Academy's Class of 1975, where 1406 were accepted and 756 graduated.) The motivation was to free male pilots for combat roles, by employing qualified female pilots to ferry aircraft from factories to military bases, and to tow drones and aerial targets. They flew over 60 million miles in every type of military aircraft, including jets. President Carter granted the WASP veteran status in 1977, and on 1 Jul 2009 the President and Congress awarded them the Congressional Gold Medal. Three of the roughly 300 surviving pilots were on hand to witness the event. (Wikipedia Page). WWII-WASP Commander, Jacqueline Cochran, (1906-1980), who dined on the Staff Tower in Mitchell Hall with Class of 1975 one year, is probably best known for being the first female pilot to break the Sound Barrier in a Canadair F-86 Sabre Jet borrowed from the Royal Canadian Air Force on May 18, 1953. Jacqueline, also considered to be one of the most gifted racing pilots of her generation, is shown here with the first male pilot to break the speed of sound (Chuck Yeager). Cochran was also the first female pilot to make a blind instrument landing; to fly a bomber across the Atlantic to Britain in 1941; to takeoff & land on an aircraft carrier; fly a fixed wing jet across the Atlantic; and, to fly at Mach 2. To this day she holds more aviation speed & distance records than any male or female alive or dead.